Did the frisky puppy in last week’s post, or the quotation from Sir Arthur Conan Doyle on the relationship between pets’ moods and that of their owners, inspire any thoughts for a story of your own around that “frisky” feeling? I was reminded of the only dog our family ever had – not my family of origin, but my kids and their dad and I. The only picture I have of that dog, sadly, was taken right before he died, at 14 years of age, with the family he had been part of for the last ten years. So you can hardly see his frisky side. You will just have to take my word for it. We had promised my son a dog when we had our own house, and for the first time in our marriage, we had one. Before it had always been rectories – I was married to a minister – or student housing. A woman at our new church worked for the Humane Society, and found this dog she just knew we’d love. “He’s such an intelligent dog!” she said, “Just like you and your family!” Flattery will get your everywhere. And he was a very sweet-tempered dog – part Border Collie, part Corgie. My son named him Chuda. The name had an odd family history. A friend of the family had once given Aidan an antique toy she’d bought at a craft fair: a clown puppet that came out of a cone when you pushed him up with a stick. Aidan was perhaps three at the time, and the toy scared him at first. But then for some reason I cannot remember, he befriended that fear, and christened the clown Chuda the Fighting Ice Cream Cone. His dad, I think, developed an odd song/chant to go with it – Chuda, the Fighting Ice Cream Cone – yah! yah! – punctuating each yah! with a clown jump. The toy was a favorite for awhile, then replaced. But the name kept getting recycled. In the woods at the top of the mountain in Sewanee, where our family lived for a year, he and his sister and best friend Phillip created a magical kingdom, and Aidan named a stream in it “Chuda’s East.” When we moved from Tennessee to Minnesota, and an intelligent dog came into our lives, his name became Chuda, and that was that. The name fit. At least phonetically. We soon learned the dog chewed anything in sight. Especially if it had an interesting smell. I tried to get the kids to pick up their clothes, or at least shut their bedroom doors. But all of us had at least one pair of crotchless pants in the years Chuda shared our home. In the winter, when no one really wanted to take him for a walk, the problem was exacerbated, as was the excavation of tootsie rolls from the cats’ litter box. Here is a thing we learned about intelligent people.They don’t really want intelligent dogs. At least intelligent people like those in our family, who spend a lot of time with their noses in books and computers, don’t want intelligent dogs. They want really dumb dogs who will lay at their feet while they write their next novel or build their Sim City. The few times we dared let Chuda outside and off leash (this was the suburbs, and he was not a reliably obedient dog), he would run circles round the house. At the Renaissance Festival one summer, I saw a border collie herding sheep, and I finally understood. He was a working dog. And we gave him next to nothing to do. When my husband and I were divorced in 2004, we became a two-household family. Neither one of us could manage pets at the time. 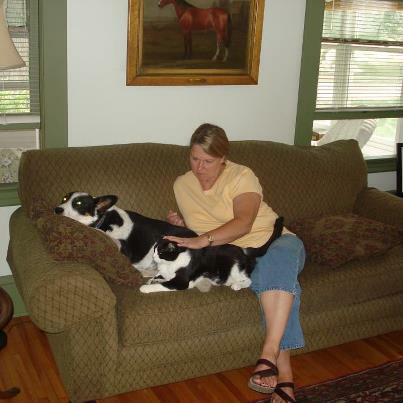 Fortunately for Chuda, another family at the church had just lost their beloved border collie, and were happy to take him in. They had a horse farm out in the country. If anyone adjusted well to divorce, it was Chuda. He lived a long and frisky life out there, and we were all grateful for that. There’s a deeper story in there, deeper and a little sadder. Someday I will dig for it. But not now. Here we are working with prompts. And brainstorming. The video starts a little slow, but the song, if you don’t already know it, is delightful. If frisky puppies don’t bring a story to your mind, maybe this will. As always, feel free to do some brainstorming of your own in the comments, or on any of the social media sites where I post. Thanks, John! Somehow your comment got stuck in the spam filter. If you hadn’t shown me how many funny reads there WERE in a spam filter, I would never have bothered to look!